The Craftsman style is rooted in the Arts and Crafts movement which influenced much of the architecture popular in the early part of the 20th century. This style emphasizes an expression of the house’s structure in its form and detail. Regional craftsmen utilized the Arts and Crafts principles of design and construction techniques to create beautiful examples of this style. 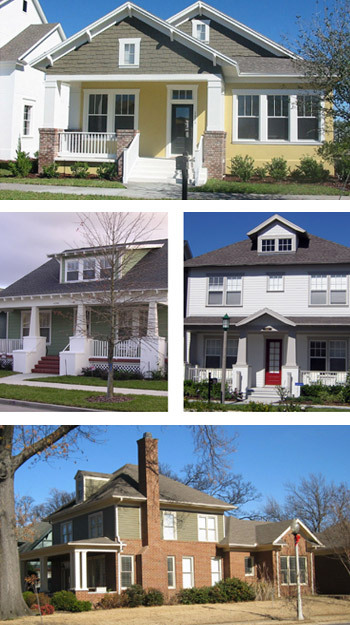 The style has been easily adapted to various regions of the country both as modest cottages and as larger homes. 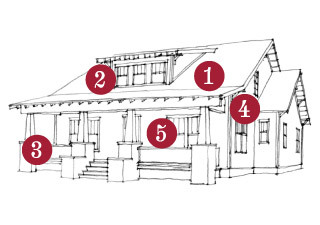 Distinctive in their broad proportions, Craftsman houses are typically asymmetrical but balanced compositions with low sloping roofs that emphasize the horizontal lines. Wide gabled or shed dormers containing broad divided light or grouped windows are common, continuing the emphasis on the horizontal. The Craftsman house is casual in character, with simple detailing and open rafters, broad open porches, large windows and deep roof overhangs. 1. Low-pitched roofs with wide bracketed overhangs, generally gable-end. 2. Wide gable or shed dormers with multiple windows. 3. Square or tapered wood columns that typically rest on piers that continue down to grade. 4. Integral porch with lower roof pitch, spans either full or partial width of main body. 5. Windows and doors are an asymmetrical but balanced composition. A. Roofing – Architectural dimension shingles. B. Cladding – Siding with 4-inch to 6-inch exposure, shake shingles, light sand finish stucco and brick. C. Columns – Thick and square, usually tapered, with a base of 2-foot-4-inch to 2-foot-8-inch square piers in brick, cut stone, light sand finish stucco, or shake shingles. D. Foundation – Brick, cut stone or light sand finish stucco at main body and porch. E. Railing – Knee wall to match column base, open heavy wood rail, or straight treated wood or composite material pickets and rail. F. Brackets – Treated wood or simulated wood.